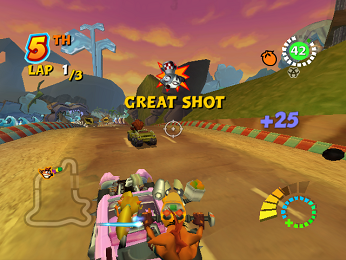 OverviewThe third racing game in the Crash Bandicoot franchise. Play as eight characters from the Crash bandicoot series! In a word, this game is awesome. 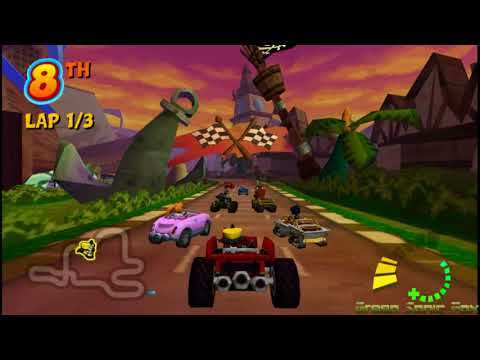 In lots more words, this is a racing game starring Crash Bandicoot and his cast of wacky characters. It's a no-holds-barred race to the finish with all the nonstop action and humor that is only natural for our fuzzy, orange friend. The story is simple: Ebeneezer Von Cluctch, owner of Von Clutch's MotorWorld, has lost all of his power gems. But lucky him, Crash Bandicoot just so happened to be in the area. Von Clutch offers whoever brings him his power gems the ownership of his park. So, Crash and his nemesis Dr. Neo Cortex set off to find them. Crash is really the only playable character in the 1-Player platforming areas. He goes around, completing missions for new racers and power crystals, which also play an important role in beating the game. Along the way, you will crash and smash your way to first place with a series of crazy races that must be seen to be believed! It works similarly to Mario Kart: Double Dash, but with a twist: Instead of picking two racers from the get-go, you choose a single racer, but you can clash with any other racer on the track to form an unstoppable killing machine! Use these weapons to blow away the competition - literally! Crashinator - Mow down objects that have been scattered all over the track. If you destroy enough, you'll get lots of coins to spend on cool stuff! Fast Lap - Drive one lap around the track of your choice to get the best time around! Rolling Thunder - You start as a clashed monstrosity with only one mission - blow up the other racers as much as you want! There's a number to win some stuff, but, personally, I have too much fun blowing things up to notice. Run and Gun - Using your clashed weapon, destroy airborne targets to win fabulous prizes! In other words, get this game. You won't regret it! Now you can add videos, screenshots, or other images (cover scans, disc scans, etc.) 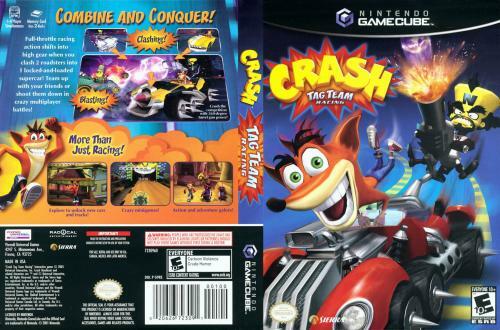 for Crash Tag Team Racing to Emuparadise. Do it now!